2015 BC WEDDING AWARDS WINNER!! Hello 2016! I hope you’ve all had a fantastic holiday season, and a huge congratulations to those of you who got engaged over the holidays. Big year-end news from us! Just over a month ago was the awards night gala for the 2015 BC Wedding Awards, and we’re still riding the high from it. WE WON!!! This year was my first time submitting an entry & attending. It’s a huge honour in the wedding industry, and such a fun night. I was especially looking forward to catching up with great friends in all corners of the wedding industry. (As wedding photographers, we tend to be crazy busy through the summer months, at our computers editing around the clock through the fall…then winter comes and we pop up and find each other again). It was fun to get all gussied up and mingle with a glass of wine, and we even got to be part of the “Taster’s Choice” category selection. We sampled wedding cakes and hors d’hoeuvres, from different stations around the theatre, then cast our ballots. I felt like a judge on Top Chef! The food was amazing, and my votes ended up being for the winners: Anna Elizabeth Cakes and No Fixed Address Catering. What I found particularly awesome about No Fixed Address, was that they were serving lamb (which I don’t eat) and when I starting moving on, they immediately offered to have a chef quickly make a vegetarian version for me. And it was AHHH-mazing. Going above and beyond AND having great food gets my vote for sure. As the awards portion was about to start, I sat down with Faye Smith (Makeup & Hair) who I’d worked with before, and when she won for ‘Best Wedding Hairstyle’ I was thrilled. Then when the photo booth category came up I saw Wink Photography appear on the big screen as a finalist. (We aren’t warned ahead of time). I frantically clutched onto the girls beside me, and shrieked “THAT’S ME!!!!”. (They clearly already knew that). Next, the presenters announced Wink as the winner, and I was so shocked/thrilled that I hopped up and very gracefully knocked my friend’s gin & tonic all over my iphone, program, and legs. When I got to the stage I hugged the presenters, accepted the VERY heavy award, and looked out to the 600+ person audience. I thought if I could at least focus on some familiar faces I wouldn’t be so nervous, but the house lights were shining right in my eyes and I was at a total loss for words. I’m not one to prepare a speech for something like this…but clearly I should have. The speech eloquently began with an expletive, or so I’ve been told. Whoops. Anyway, here is the winning series. This was Emet & Jill’s wedding at the Waldorf Hotel this fall…what a party! 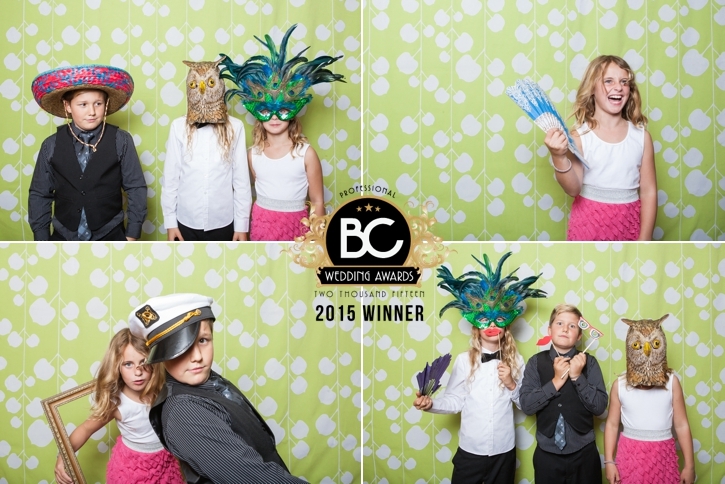 My husband David operates the photo booth at our events and he had so much fun being silly with these kids. One of the benefits to an open air booth like this… plenty of room to move, change, and be creative. Looking forward to many more Winkbooth antics in 2016! Hop on over to the info page to find out more about how it all works. And you can check out the winners from all categories HERE!